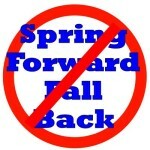 If you’re aware of another grass roots effort or social media venue relating to Daylight Saving Time in general or seeking specific DST changes, please contact us. This site looks to have been active from 1995 to 2008. There’s an interested proposal there to simply put the US into only two time zones and go from there. A grass-roots effort in Colorado is attempting to put a ballot initiative to the state’s voters to put the state on Year-Round DST. See this Fox 31 online article describing their effort. They also have a web site and a Facebook page with more information. There’s a Facebook site, whose “About” section indicates their purpose “To educate the nation and the world of the ill effects of DST with the aim of repealing the legislation.” There’s a link there to request their website address; not sure why they’d want that to be private. There are some posts of news articles on the Facebook page, but as of February 6, 2015, the last post was November 7, 2014. 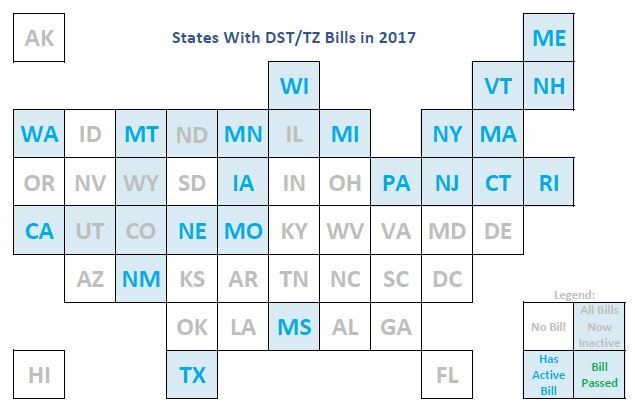 Looks to us like they’re missing out on the most active DST-legislation year so since the mid-60s!